When it comes to your children, you’ll do anything to make sure they stay far away from hardships and pain. What if bringing them to the dentist at an early age could do just that? That’s right. 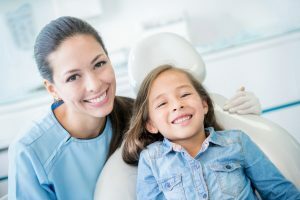 Bringing your child to visit their children’s dentist in Federal Way can actually save them fear and pain in the long run. Drew Beaty DDS Family & Cosmetic Dentistry wants you to know what to expect during your son or daughter’s first dental appointment. When should my child’s first dental appointment be? Pediatricians and dentists agree with the American Academy of Pediatric Dentistry. They stated that your child’s first dental visit should at the latest be by his or her’s first birthday. Although you may not expect it, your child becomes susceptible to developing cavities at a very early age. Studies have shown an increase in cavities within preschooler’s mouths. To be exact, about one in four children in the United States have had at least one cavity by the age of four! The cause could be a lack of dental attention from parents and guardians or even the increase in sugary processed foods. How can your Federal Way children’s dentist help your child avoid tooth decay at an early age? By having your child visit Drew Beaty DDS Family & Cosmetic dentistry, you will be equipped with the information your family needs to lower risks for cavities and practice proper dental hygiene. What can my child and I expect during their first dental appointment? Protection against cavities with dental sealants and fluoride treatment. Professional cleanings to remove harmful dental plaque ad debris. Why are positive dental experiences so important? Our dental office is committed to providing our young patients happy, light, and fun dental experiences. Why? Children are still forming their options on each thing that faces them, including dentistry. By bringing them to a dentist that takes the severity of developed dental phobia seriously, we can combat dental fear together at an early age. If your child has just erupted their first tooth, it’s time to bring them into our office. Scheduling an appointment for your little one is as easy as giving our office a call. One of our friendly office team members will be able to help you find the best time to bring your child in to get the dental care they deserve.